On the 9th of June, I was certified by behalf of my high school that I have completed my last year, and thus received my Diploma(Finally lol). 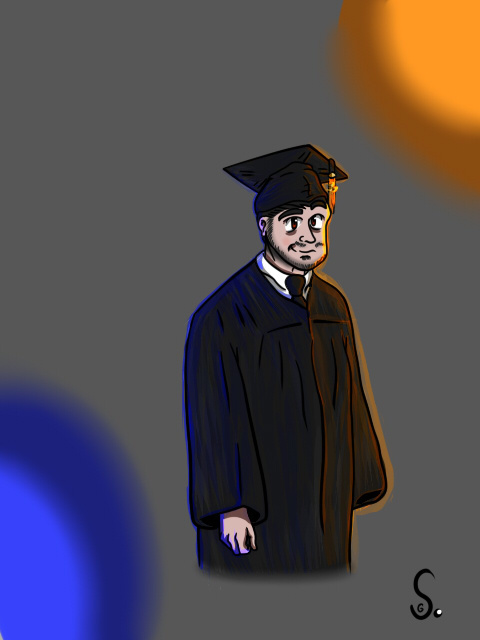 I decided to draw myself in my Cap and Gown based on my graduation picture I received a couple days before the ceremony that night (Funny fact, I had to order the pictures twice because the first time, there was NOTHING inside the envelope! jeez nice one, lmao). Anyway, now that my high school have finally concluded, I shall now focus on finding a Job(now that I'm living with my mother, Bye Dad. ), Enrolling at a nearby college, and MOST importantly, fufill my career as a graphic designer.....by entering my major as an Animator.